The Delaware, Lackawanna & Western Railroad (also known as the DL&W or Lackawanna Railroad) was a U.S. Class 1 railroad that connected Buffalo, New York, and Hoboken, New Jersey, a distance of about 400 miles (640 km). Incorporated in 1853, the DL&W was profitable during the first two decades of the twentieth century, but its margins were gradually hurt by declining traffic in coal and competition from trucks. In 1960, the DL&W merged with rival Erie Railroad to form the Erie Lackawanna Railroad. "The Lackawanna Valley", a painting by George Inness at the National Gallery of Art in Washington, D.C., depicts a Delaware, Lackawanna & Western train heading westward from Scranton, Pennsylvania, in 1855, four years after the railroad began operations. The roundhouse sits on the present-day site of Steamtown National Historic Site. 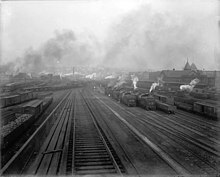 The forge of Lackawanna Iron & Coal Co. and Lackawanna Avenue are depicted in the background. The Delaware, Lackawanna and Western Railroad's Hoboken Terminal is the only active surviving railroad terminal alongside the Hudson River and is a nationally recognized historical site. The Leggett's Gap Railroad was incorporated on April 7, 1832, but stayed dormant for many years. It was chartered on March 14, 1849, and organized January 2, 1850. On April 14, 1851, its name was changed to the Lackawanna and Western Railroad. The line, running north from Scranton, Pennsylvania, to Great Bend, just south of the New York state line, opened on December 20, 1851. From Great Bend the L&W obtained trackage rights north and west over the New York and Erie Rail Road to Owego, New York, where it leased the Cayuga and Susquehanna Railroad to Ithaca on Cayuga Lake (on April 21, 1855). The C&S was a re-organized and partially re-built Ithaca and Owego Railroad, which had opened on April 1, 1834, and was the oldest part of the DL&W system. 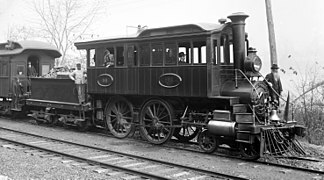 The whole system was built to 6 ft (1,829 mm) broad gauge, the same as the New York and Erie, although the original I&O was built to standard gauge and converted to wide gauge when re-built as the C&S. The rest of the line, now known as the Southern Division, opened on May 27, 1856, including the New Jersey section (the Warren Railroad). A third rail was added to the standard gauge Central Railroad of New Jersey east of Hampton to allow the DL&W to run east to Elizabeth via trackage rights (the CNJ was extended in 1864 to Jersey City). On December 10, 1868, the DL&W bought the Morris and Essex Railroad. This line ran east-west across northern New Jersey, crossing the Warren Railroad at Washington and providing access to Jersey City without depending on the CNJ. 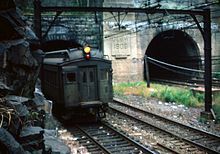 The M&E tunnel under Bergen Hill opened in 1876, also relieving it of its use of the New York, Lake Erie and Western Railway in Jersey City. Along with the M&E lease came several branch lines in New Jersey, including the Boonton Line (opened in 1870), which bypassed Newark for through freight. The DL&W bought the Syracuse, Binghamton and New York Railroad in 1869 and leased the Oswego and Syracuse Railroad on February 13, 1869. This gave it a branch from Binghamton north and northwest via Syracuse to Oswego, a port on Lake Ontario. The Greene Railroad was organized in 1869, opened in 1870, and was immediately leased to the DL&W, providing a short branch off the Oswego line from Chenango Forks to Greene. Also in 1870 the DL&W leased the Utica, Chenango and Susquehanna Valley Railway, continuing this branch north to Utica, with a branch from Richfield Junction to Richfield Springs (fully opened in 1872). The Valley Railroad was organized March 3, 1869, to connect the end of the original line at Great Bend, Pennsylvania to Binghamton, New York, avoiding reliance on the Erie. The new line opened October 1, 1871. By 1873, the DL&W controlled the Lackawanna and Bloomsburg Railroad, a branch from Scranton southwest to Northumberland (with trackage rights over the Pennsylvania Railroad's Northern Central Railway to Sunbury). On March 15, 1876, the whole system was re-gauged to standard gauge in one day. The New York, Lackawanna and Western Railroad was chartered August 26, 1880, and opened September 17, 1882, to continue the DL&W from Binghamton west and northwest to Buffalo. The main line ran to the International Bridge to Ontario, and a branch served downtown Buffalo. 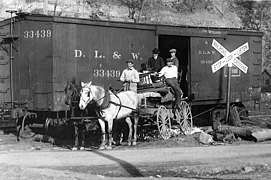 On December 1, 1903, the DL&W began operating the Erie and Central New York Railroad, a branch of the Oswego line from Cortland Junction east to Cincinnatus. By 1909, the DL&W controlled the Bangor and Portland Railway. This line branched from the main line at Portland, Pennsylvania southwest to Nazareth, with a branch to Martins Creek. The DL&W built a Beaux-Arts terminal in Hoboken in 1907, and another Beaux-Arts passenger station (now a Radisson hotel) in Scranton the following year. A new terminal was constructed on the waterfront in Buffalo in 1917. The Paulinskill Viaduct on the Lackawanna Cut-Off in Hainesburg, New Jersey, was the largest concrete bridge in the world when it was completed in 1910. The Tunkhannock Viaduct in Nicholson, Pennsylvania, in October 1988. A Delaware & Hudson Railway train on the bridge is dwarfed by the structure, which stands 240 feet (73 m) above the creek for which it is named. The Lackawanna Railroad of New Jersey, chartered on February 7, 1908, to build the Lackawanna Cut-Off (a.k.a. New Jersey Cutoff or Hopatcong-Slateford Cutoff), opened on December 24, 1911. This provided a low-grade cutoff in northwestern New Jersey. The cutoff included the Delaware River Viaduct and the Paulinskill Viaduct, as well as three concrete towers at Port Morris and Greendell in New Jersey and Slateford Junction in Pennsylvania. From 1912 to 1915, the Summit-Hallstead Cutoff (a.k.a. Pennsylvania Cutoff or Nicholson Cutoff) was built to revamp a winding and hilly system between Clarks Summit, Pennsylvania, and Hallstead, Pennsylvania. This rerouting provided another quicker low-grade line between Scranton and Binghamton. The Summit Cut-Off included the massive Tunkhannock Viaduct and Martins Creek Viaduct. The Lackawanna's cutoffs had no at-grade crossings with roads or highways, allowing high-speed service. Changes in the region's economy undercut the railroad, however. The post-World War II boom enjoyed by many U.S. cities bypassed Scranton and the rest of Lackawanna and Luzerne counties. Oil and natural gas quickly became the preferred energy sources. Silk and other textile industries shrank as jobs moved to the southern U.S. or overseas. The advent of refrigeration squeezed the business from ice ponds on top of the Poconos. Even the dairy industry changed. The Lackawanna had long enjoyed revenues from milk shipments; many stations had a creamery next to the tracks. In January, 1959, the final nail in the Lackawanna's coffin was driven home when the Knox Mine Disaster flooded the mines along the Susquehanna River and all but obliterated what was left of the region's anthracite industry. 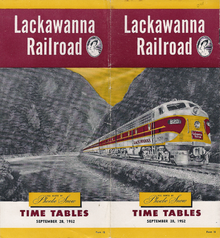 The Lackawanna Railroad's financial problems were not unique. Rail traffic in the U.S. in general declined after World War II as trucks and automobiles took freight and passenger traffic. [page needed] Declining freight traffic put the nearby New York, Ontario and Western Railroad and Lehigh & New England Railroad out of business in 1957 and 1961, respectively. Over the next three decades, nearly every major railroad in the Northeastern US would go bankrupt. Shoemaker next turned, in 1956, to aggressive, but unsuccessful, efforts to obtain joint operating agreements and even potential mergers with the Lehigh Valley Railroad and the Delaware and Hudson Railway. Finally, Shoemaker sought and won a merger agreement with the Erie Railroad, the DL&W's longtime rival (and closest geographical competitor). Even before the formal merger, it led to the abandonment of most of the Lackawanna's mainline trackage between Binghamton and Buffalo. In 1958, the main line of the DL&W from Binghamton west to near Corning, which closely paralleled the Erie's main line, was abandoned in favor of joint operations, while the Lackawanna Cut-Off in New Jersey was single-tracked in anticipation of the upcoming merger. On the other hand, the Erie's Buffalo, New York and Erie Railroad was dropped from Corning to Livonia in favor of the DL&W's main line. Most passenger service was routed onto the DL&W east of Binghamton, with the DL&W's Hoboken Terminal serving all E-L passenger trains. In addition, a short segment of the Boonton Branch by Garret Mountain in Paterson, New Jersey, was sold off to the state of New Jersey to build Interstate 80. Ultimately, the west end of the Boonton Branch was combined with the Erie's Greenwood Lake Branch, while the eastern end was combined with the Erie's main line, which was abandoned through Passaic, New Jersey. Sacrificed was the Boonton Branch: a high-speed freight line thought to be redundant with the Erie's mainline. This would haunt E-L management less than a decade later (and Conrail management a decade after that). Soon after the merger, the new E-L management shifted most freight trains to the "Erie side", the former Erie Railroad lines, leaving only a couple of daily freight trains traveling over the Lackawanna side. Passenger train traffic would not be affected, at least not immediately. This traffic pattern would remain in effect for more than ten years—past the discontinuation of passenger service on January 6, 1970—and was completely dependent on the lucrative interchange with the New Haven Railroad at Maybrook, New York. 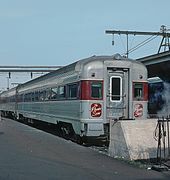 The 1970 merger of the New Haven Railroad into the Penn Central Railroad changed all this: the New England Gateway was closed, causing dramatic traffic changes for the Lackawanna side. Indeed, as very little on-line freight originated on the Erie side (a route that was more than 20 miles longer than the DL&W route to Binghamton), once the Gateway was closed (eliminating the original justification for shifting traffic to the Erie side), virtually all the E-L's freight trains were shifted back to the Lackawanna side. After the New England Gateway closed, E-L's management was forced to downgrade the Erie side, and even considered its abandonment west of Port Jervis. 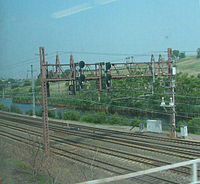 In the meantime, the E-L was forced to run its long freights over the reconfigured Boonton Line, which east of Mountain View in Wayne, NJ meant running over the Erie's Greenwood Lake Branch, a line that was never intended to carry the level of freight traffic to which the E-L would subject it. In 1972, the Central Railroad of New Jersey abandoned all its operations in Pennsylvania (which by that time were freight-only), causing additional through freights to be run daily between Elizabeth, NJ on the CNJ and Scranton on the E-L. The trains, designated as the eastbound SE-98 and the westbound ES-99, travelled via the Lackawanna Cut-Off and were routed via the CNJ's High Bridge Branch. This arrangement ended with the creation of Conrail. During its time, the E-L diversified its shipments from the growing Lehigh Valley and also procured a lucrative contract with Chrysler to ship auto components from Mount Pocono, Pennsylvania. The E-L also aggressively sought other contracts with suppliers in the area, pioneering what came to be known as intermodal shipping. None of this could compensate for the decline in coal shipments, however, and as labor costs and taxes rose, the railroad's financial position became increasingly precarious although it was stronger than some railroads in the eastern U.S. The opening of Interstates I-80, I-380, and I-81 during the early 1970s, which in effect paralleled much of the former Lackawanna mainline east of Binghamton, New York, caused more traffic to be diverted to trucks. This only helped to accelerate the E-L's decline and its inclusion into Conrail, a new regional railroad that was created on April 1, 1976, out of the remnants of seven bankrupt freight railroads in the northeastern U.S. The E-L was legally conveyed into Conrail on April 1, 1976. Initially, Conrail's freight schedule did not change much from the E-L's due to labor contracts that restricted any immediate alterations. This, too, would change. In early 1979, Conrail suspended through freight service on the Lackawanna side, citing the E-L's early-1960s severing of the Boonton Branch near Paterson, New Jersey, and the grades over the Pocono Mountains as the primary reason for removing freight traffic from the entire Hoboken-Binghamton mainline and consolidating this service within its other operating routes. A train on the Morristown Line in South Orange, NJ. Two Arrow III singles lead an Arrow II pair. The busy Morristown Line is the only piece of multi-track railroad on the entire 900-mile Lackawanna system that has not been reduced to fewer tracks over the years. 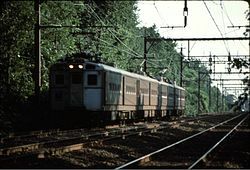 In the 1986 photograph to the right, a set of Arrow III single units and an Arrow II married pair runs eastbound after passing the NJ Transit station in South Orange, New Jersey. The line was triple-tracked nearly a century prior, and remains so today. The Lackawanna Cut-Off was abandoned in 1979 and its rails were removed in 1984. The line between Slateford Junction and Scranton remained in legal limbo for nearly a decade, but was eventually purchased, with a single track left in place. The Lackawanna Cut-Off's right-of-way, on the other hand, was purchased by the state of New Jersey in 2001 from funds approved within a $40 million bond issue in 1989. (A court later set the final price at $21 million, paid to owner Gerald Turco of Kearny, New Jersey.) NJ Transit has estimated it would cost $551 million to restore service to Scranton over the Cut-Off, a price which includes the cost of new trainsets. A 7.3-mile section of the Cut-Off between Port Morris and Andover, New Jersey which was under construction has been delayed due to environmental issues on the Andover station site; the Cut-Off between Port Morris to Andover is slated to re-open for rail passenger service no earlier than 2021. In 1979, Conrail sold most of the DL&W in Pennsylvania, with the DL&W main line portion between Scranton and Binghamton which includes the Nicholson Cutoff was bought by the Delaware and Hudson Railway. The D&H was purchased by the Canadian Pacific Railway in 1991. CPR continued to run this portion of the DL&W main line until 2015, when it was purchased by Norfolk Southern. The Syracuse and Utica branches north of Binghamton have been retained, sold by Conrail to the DO Corp., which operates them as the northern division of the New York, Susquehanna and Western Railway. In 1997, Conrail was bought by CSX Transportation and the Norfolk Southern Railway. On June 1, 1999, Norfolk Southern took over many of the Conrail lines in New Jersey, including most of the former DL&W. It also purchased the remnants of the former Bangor & Portland branch in Pennsylvania. Norfolk Southern continues to operate local freights on the lines. In 2015, it purchased the former DL&W main from Taylor, PA to Binghamton, NY from the Canadian Pacific Railway, which it continues to operate to this day. NJ Transit took over passenger operations in 1983. The state of New Jersey had previously subsidized the routes operated by the E-L, and later Conrail. NJ Transit operates over former DL&W trackage on much of the former Morris & Essex Railroad to Gladstone and Hackettstown. In 2002, the transit agency consolidated the Montclair Branch and Boonton Line to create the Montclair-Boonton Line. NJ Transit also operates on the original eastern portion of the Boonton Line known as the Main Line. NJ Transit's hub is at Hoboken Terminal. Trains on the Morristown Line run directly into New York's Pennsylvania Station via the Kearny Connection opened in 1996. This facilitates part of NJ Transit's popular Midtown Direct service. Formerly the line ran to a terminal in Hoboken and a transfer was required to pass under the Hudson river into Manhattan. This is the only section of former Lackawanna trackage that has more through tracks now than ever before. Since the 1999 breakup of Conrail, the former DL&W main line from Scranton east to Slateford into Monroe County is owned by the Pennsylvania Northeast Regional Rail Authority. The Delaware-Lackawanna Railroad and Steamtown National Historic Site operates freight trains and tourist trains on this stretch of track, dubbed the Pocono Mainline (or Pocono Main). Under a haulage agreement with the Canadian Pacific Railway, the D-L runs unit Canadian grain trains between Scranton and the Harvest States Grain Mill at Pocono Summit, Pennsylvania. Excursion trains, hauled by Nickel Plate 765 and other locomotives, run from Steamtown to Moscow and Tobyhanna on the Pocono Mainline. The D-L also runs Lackawanna County's tourist trolleys from the Electric City Trolley Museum, under overhead electrified wiring installed on original sections of the Lackawanna and Wyoming Valley Railroad purchased by Lackawanna County. It also runs trains on a remnant of the DL&W Diamond branch in Scranton. In 2006, the Monroe County and Lackawanna County Railroad Authorities formed the Pennsylvania Northeast Regional Rail Authority to accelerate the resumption of commuter train service between New York City and Scranton. Most of the main line west of Binghamton in New York state also is abandoned, in favor of the Erie's Buffalo line via Hornell. The longest remaining main line sector is Painted Post-Wayland, with shortline service provided by B&H Railroad (Bath & Hammondsport, a division of the Livonia, Avon, and Lakeville Railroad). Shorter main line remnants are Groveland-Greigsville (Genesee & Wyoming) and Lancaster-Depew (Depew, Lancaster & Western). The Richfield Springs branch was scrapped in 1998 after being out of service for years; as of 2012, the new owners of the right-of-way are looking for a new narrow-gauge shortline passenger operator. The Cincinnatus Branch, abandoned by Erie Lackawanna in 1960, was partially rebuilt for an industrial spur about 1999. As of 2018, the Reading Blue Mountain and Northern operates the former Keyser Valley branch from Scranton to Taylor, as well as the former Bloomsburg branch from Taylor to Coxton Yard in Duryea. The Luzerne and Susquehanna Railway operates the former Bloomsburg branch from Duryea to Kingston. The North Shore Railroad (Pennsylvania) operates the former Bloomsburg branch from Northumberland to Hicks Ferry. In 2012, the Lackawanna Railroad paint scheme returned to the rails on Norfolk Southern NS #1074, an EMD SD70ACe locomotive, as part of Norfolk Southern's celebration of 20 of its predecessor lines. ^ Rachunis, William; Fortney, Gerald W. (January 22, 1959). Report of Major Mine Inundation Disaster, River Slope Mine, May Shaft Section, Schooley Colliery, Knox Coal Company, Incorporated, Port Griffith, Luzerne County, Pennsylvania. Wilkes-Barre, Pa.: U.S. Department of the Interior, Bureau of Mines. ^ "Grouping America's Railroads - The Transportation Act of 1920". Classic Trains: 30–37. Winter 2011. ^ The Old Road tracks into Delaware would be removed during the 1990s, except for tracks on the bridge to Portland and to Slateford Junction, which are still operated by Norfolk Southern and Delaware-Lackawanna Railway, respectively. ^ Erie Lackawanna East, Karl R. Zimmermann, Quadrant Press, Inc., 1975. ^ "BOARD OF DIRECTORS MEETING - Mar 9th, 2016". njtransit.granicus.com. Retrieved 2017-03-30. ^ "Norfolk Southern's Heritage Locomotives". Norfolk Southern. July 4, 2012. Retrieved August 6, 2015. King, Shelden S. (1991). The Route of Phoebe Snow: A Story of the Delaware, Lackawanna, and Western Railroad. Flanders, New Jersey: Railroad Avenue Enterprises. McCabe, Wayne T.; Gordon, Kate (2003). A Penny A View—An Album of Postcard Views—Building the Lackawanna Cut-off in Sussex and Warren Counties, New Jersey. Newton, New Jersey: Historic Preservation Alternatives. Wikimedia Commons has media related to Delaware, Lackawanna and Western Railroad.